Nocino is an Italian liqueur made with green walnuts whose dark magical blend is not just delicious and warming in the winter when it’s ready to be drunk, but whose seeping uncovers just how emersed Christian traditions are in their Italian folklore past. 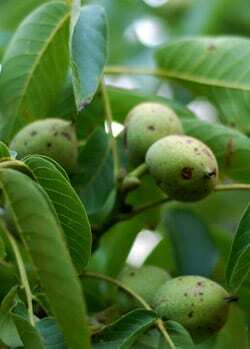 Walnut trees were famous for being sacred to witches due to their self-sufficient hermaphrodite qualities and their ability to weather the harshest elements, including drought, and still bear fruit. The nuts themselves were the pride of Rome and known as Jupiter’s nuts, Jovis glans, which the gods dined upon whereas man ate acorns. Following hotly in the footsteps of the witches’ Sabbath, the summer solstice and shortest night of the year came St John the Baptist Day,the 24 June, which continued the tradition of celebrating light’s battle over darkness. If you were going to brew a drink ready for the winter solstice what better day to pick to start the process! Actually outside all its magical and religious symbology, this start date is considered beneficial simply because it precedes the walnut moth caterpillar beginning its lifecycle and feasting on the soft kernels and husks. Traditionally the very best Nocino requires barefoot virgins gathering an uneven figure (21 or 23) of soft, green, dew-laden walnuts which they would leave to dry by the remains of the threshing fires that had been used to quicken the laborious process of separating the wheat. If a virgin was feeling a little left on the shelf, it was at this time they were encouraged to pick St John’s Wort to naturally combat depression and hang the remainder outside to see off the evil eye. Traditionally Nocino mustn’t be tried before the 3rd November although there are people that advise letting a year go past for this walnut liqueur to mellow before you drink it! You can rest assured that not only will it warm your spirit and fend off evil and bad spirits as dark nights close in, this walnut elixir it will also potentially work a little of its oily omega magic on skin conditions such as acne and eczema, as well as sore throats. 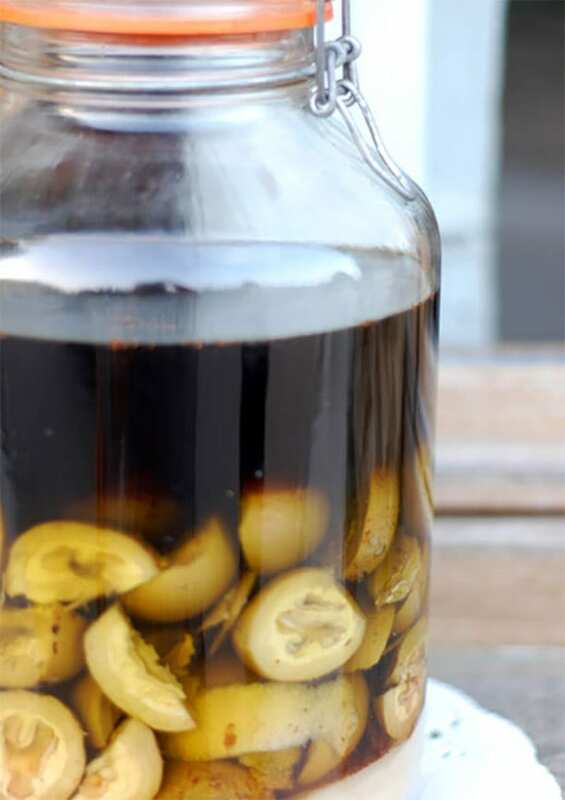 This year I’m going to try a variation of the Nocino recipe offered by The Florentine and MyMansBelly, as I am curious what the addition of the coffee beans will bring. Thanks to La Grande Quercia b&b for use of their seeping nocino and bag of 23 walnuts! 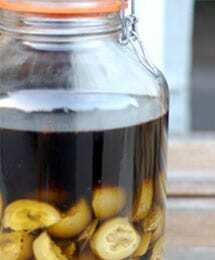 Italy's famous green walnut liqueur Nocino needs to mellow, no tasting before the 3rd November! Split the vanilla pods lengthways down one side and scrape the seeds of the pod into the alcohol, before adding the remains of the pod along with the cloves, cinnamon and coffee beans and add into a large preserving jar. Wearing rubber gloves as walnuts badly stain, cut each walnut into quarters add into the alcohol with the other aromatic ingredients, close the lid and leave to macerate/steep in a cool dark place during which time the flavours and colours will seep out and infuse with the alcohol. Strain the aromatic liquid that your walnuts are steeping in. Pour the dark liquid into the cooled sugar syrup, stir gently and bottle. Jane Charlotte McGraw Weiss this is a slightly different recipe than I use, but I will try it this year. I’m picking my walnuts this morning, before the heat of the day. This is the first time I've actually made it, I've tried plenty of other peoples, it's amazing how different they all are, what's the difference in taste with the French one Michelle?. The added coffee bean mix really appealed to me not just for taste but I've some Jamaican Blue Mountain Coffee Beans from a client desperate to be used in something! I think everyone will be getting a bottle of this or Ratafia this year, economy drive presents could be worse! Ah! First taste on November 3rd, huh? Any left from last year's batch, then??? I have a friend who makes Nocino's French equivalent, vin de noix and gifts them at Christmas. Love it!! !